Robotic Arms have proved themselves useful and more productive in many applications where speed, accuracy and safety is required. But to me, what’s more than that is these things are cool to look at when they work. I have always wished for a robotic arm that could help me with my daily works just like Dum-E and Dum-U that Tony stark uses in his lab. These two bots can be seen helping him while building the Iron man suits or filming his work using a video camera. Actually Dum-E has also saved his life once....... and this is where I would like to stop it because this is no fan Page. Apart from the fictional world there are many cool real world Robotic Arms made by Fanuc, Kuka, Denso, ABB, Yaskawa etc. These robotic arms are used in Production line of automobiles, mining plants, Chemical industries and many other places. 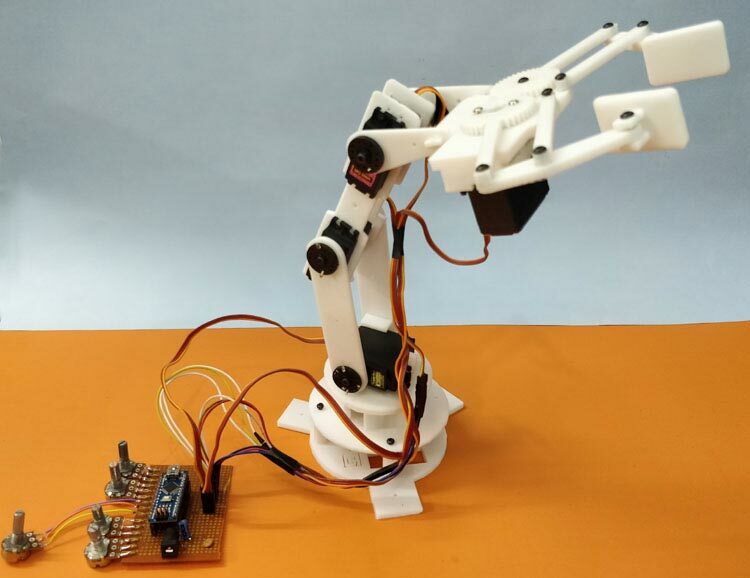 The most time consuming part in building this robotic Arm is while building its body. Initially I started by designing the body using Solidworks, but later realised that there are many awesome designs readily available on Thingiverse and there is no need to re-invent the wheel. So I went through the designs and found that the Robotic Arm V2.0 by Ashing will work perfectly with our MG995 Servo Motors and would exactly suit our purpose. In the recording mode the user has to control the bot using the Potentiometers. Each POT corresponds to a individual motor, as the pot is varied we should save the position of the motor and the motor number inside the saved_data array. Let’s see how that is achieved using the Record function. Hope you understood the project and enjoyed building it. If you have any problem in getting it to work you can use the comment section below or the forums for more technical help. You can use this bot and build more things on top of it. I am planning to give it some vision using Raspberry Pi and Open CV and check what it can do. What are your ideas? Leave them in the comment section and I will be happy to hear from you. I tired running the code ,I am getting this error .So can u plzz fix this. Sketch uses 4934 bytes (16%) of program storage space. Maximum is 30720 bytes. Global variables use 1798 bytes (87%) of dynamic memory, leaving 250 bytes for local variables. Maximum is 2048 bytes.